We generated transgenic (Tg) mice in which ATR is partially inhibited in skin. Compared with transgene-negative littermate controls (Ctrl), inhibition of ATR function in Tg mice delayed tumor onset and suppressed UV tumorigenesis. We generated transgenic mice expressing a kinase-dead form of ATR (ATR-kd) in skin. ATR-kd transgene expression in keratinocytes inhibits UV responses and augments UV-induced apoptosis via ATR-Chk1 pathway inhibition. ATR-kd transgenic mice chronically irradiated with UV demonstrate longer tumor latency and lower skin tumor incidence. ATR-kd mice demonstrate a trend toward decreased number of invasive squamous cell carcinomas. Multiple human epidemiologic studies link caffeinated (but not decaffeinated) beverage intake with significant decreases in several types of cancer, including highly prevalent UV-associated skin carcinomas. The mechanism by which caffeine protects against skin cancer is unknown. Ataxia telangiectasia and Rad3-related (ATR) is a replication checkpoint kinase activated by DNA stresses and is one of several targets of caffeine. Suppression of ATR, or its downstream target checkpoint kinase 1 (Chk1), selectively sensitizes DNA-damaged and malignant cells to apoptosis. Agents that target this pathway are currently in clinical trials. Conversely, inhibition of other DNA damage response pathways, such as ataxia telangiectasia mutated (ATM) and BRCA1, promotes cancer. To determine the effect of replication checkpoint inhibition on carcinogenesis, we generated transgenic mice with diminished ATR function in skin and crossed them into a UV-sensitive background, Xpc–/–. Unlike caffeine, this genetic approach was selective and had no effect on ATM activation. These transgenic mice were viable and showed no histological abnormalities in skin. Primary keratinocytes from these mice had diminished UV-induced Chk1 phosphorylation and twofold augmentation of apoptosis after UV exposure (P = 0.006). 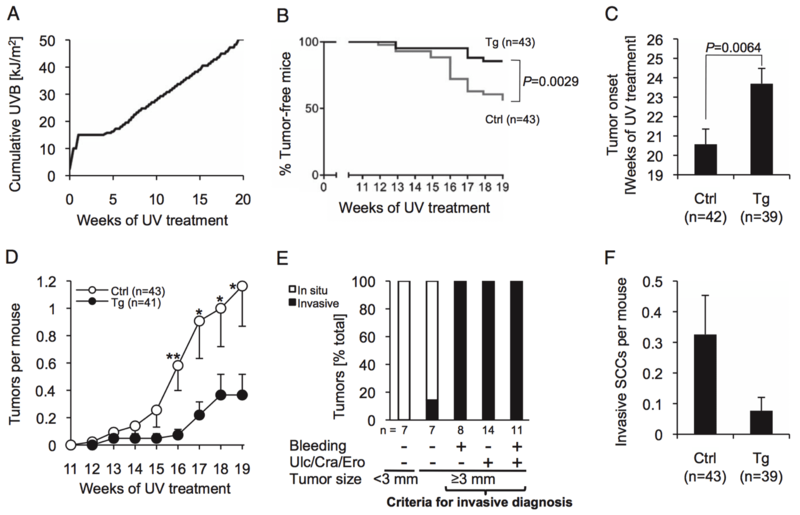 With chronic UV treatment, transgenic mice remained tumor-free for significantly longer (P = 0.003) and had 69% fewer tumors at the end of observation of the full cohort (P = 0.019), compared with littermate controls with the same genetic background. This study suggests that inhibition of replication checkpoint function can suppress skin carcinogenesis and supports ATR inhibition as the relevant mechanism for the protective effect of caffeinated beverage intake in human epidemiologic studies.